A playwright falls in love with a photograph of an actress and goes back in time to meet her. Sometimes a wee review just isn’t enough words to write about a movie. So, I’m adding this a new main features (more in-depth) review of Somewhere in Time (1980), my favourite romantic film of the seventies. This post, unlike my previous post is full of spoilers, so if you want a spoiler free version CLICK HERE now. The film tells of the handsome, Richard Collier (Christopher Reeve) as a present day playwright. Collier falls for an alluring actress from 1912, Elise McKenna (Jane Seymour) after seeing her photograph, and goes back in time to woo her. Along with William Fawcett Robinson (Christopher Plummer) as her manager and the villain of the piece complete with a goatee and moustache. Because in soft focus seventies romantic movies, that’s all the ingredients you need in this recipe for getting me in tears before the pair even meet. With this time travel tale told from the viewpoint of the romantic lead character, Richard Collier, the film starts in May 1972, at an after show party. The show’s young playwright Richard Collier is there with his girlfriend, and the centre of attention with his play being Broadway bound. An old woman approaches him, gives him a pocket watch with the words “Come back to me” leaving him visibly shaken. Then she leaves, returning to the Grand Hotel. She appears wistful as she returns to her room without a word. Listening to Rachmaninoff (Rhapsody of a Theme of Paganini), she traces his name on the show’s programme as she sits in the rocking chair, admiring the view from the window. The film travels on to 1980 where with the same Rachmaninoff piece playing on his record player, we remeet Collier as now an unattached, award-winning playwright with writer’s block. To recharge he takes a break, and is drawn to stay at the Grand Hotel. And there he chats with the bell boy Arthur, an old man, who has lived in the hotel since 1910. Arthur asks if they’ve met before. Collier visits the Hotel’s Hall of History museum, where he is captivated by a photograph of a young lady. On questioning Arthur, he finds it is of an actress who stayed in the hotel in 1912, Elise McKenna. And after finding a more recent picture, finds out it was the old woman who gave him the pocket watch, and is now a recluse. Her last acting role before this self seclusion was at the Grand Hotel in 1912. After he approaches an authoress who wrote about Elise, he discovers that Elise had died the night they met in 1972. He discovers that she owned a book on time travel by one of his college professors. And she had a model of the Grand Hotel, which plays that Rachmaninoff Rhapsody on opening the roof. Still infatuated with Elise, Collier meets this professor who assures him time travel is possible (as he had a brief experience himself). Collier uses hypnosis via a tape recorder to try to return to her and fails. Collier is spurred on by seeing his name in the 1912 hotel guest book. After disposing of all modern-day objects and acquiring an Edwardian suit and coins, and using self-hypnosis he is successful and returns to the hotel in 1912. In 1912, he meets the young Arthur. And then on going to the hotel theatre hopes to meet the girl of his dreams. He meets Elise walking at the lakeside. There she greets him with “Is it you?”, however minutes later her manager Robinson shows. Collier “meets” her again at a dance after dinner. But he gets a not so friendly warning from Robinson to leave her alone. However on her insistence, she talks with him, and he questions her about her greeting at their first meeting. On her own with her manager, she asks if he is the one, with Robinson replying only she can tell. The morning after in the wee small hours, Collier begs, then convinces her through humour then charm for a date. On his way to meet her, he is cornered by Robinson, who almost jealously asks him about his true motives. Then with a soft focus, romantic montage Collier and Elise meet up and fall in love as their relationship blossoms throughout the day. It’s so romantically filmed, it’s almost like a painting. He finds out the meaning of that greeting from her, that Robinson had warned her about a man who would change her life. With their date ending with a snog. Then during her play that evening, she breaks off from the play talking directly to him in the audience of her love for him. And at the break in the play she poses for that photograph, with her loving look seen in the photograph directed at Collier. During the play, Robinson summons Collier to speak with him. Robinson tells Collier that he hope to make Elise a star and appears to have the best of intentions for her. Then the dastardly one has Collier hit, bound and gagged. However after the performance with Collier nowhere to been seen, Elise’s acting company is due to move on. Waking up in the stables Collier frees himself and then tries to find her, finding the acting company have moved on. Sitting on a bench outside the hotel, he’s heartbroken, and then in the background we see her. She sees him. He sees her. There is what seems like the biggest staircase in the world between them. Ever. Of course he tries to go back to her. Weak and pale looking he is visibly heartbroken. He wanders in the hotel grounds, a sad and dejected character. Then Collier is found almost collapsed in his hotel room, having not eaten for a week. His life fades away, despite input from a doctor. Collier smiles, as he sees Elise, as she was in 1912 and takes her outstretched hand.. and that tune returns for the last time as the final credits roll. This film is one for all romantics of all ages. I dare even the most skeptical romantic film critic not to watch it and be moved by this beautiful, heart-rending story. It’s wonderfully played by the three main leads. Reeve and Seymour, the most photogenic of seventies screen lovers make you believe in their characters completely. Reeve gives a touchingly sweet performance as the lovelorn playwright. His nervousness in rehearsing his speeches to sweep her of her feet and in his melancholic performance at the end, add to his credibility in this role. Seymour also gave an enchanting, stunning performance as Elise. And in her poignant monologue where her character tells Collier of her love for him, breathtaking, sincere and heartbreaking with you knowing the outcome. Plummer with his goatee was at first hard to read. Was he a man with the best of intentions for his protege then possibly jealous of the pair’s burgeoning romance? It was favourable Collier asked him about this in this movie, about his reasons for his concern for Elise. Which gave Robinson a chance to redeem himself, which he did admirably in Plummer’s eloquent dulcet tones. However after this Robinson unmasked himself as a villain by having Collier struck, bound and gagged. The romance had a May fly feel to it with it only lasting for a less than a day in total. But with the repercussions for this lasting her character’s lifetime. Reeve’s chemistry with Seymour is wonderful, and their screen time together as a couple short but long enough. These scenes were wonderfully acted and scripted with a nice pace but no urgency, Easily demonstrating just how much love had affected them in this short time. It was just that the story continues after his return to the present day and these events told from Collier’s viewpoint in this part of the story line. And how much his return affected him to that devastating and heartwarming ending. Although the loved up pair were reunited in the final scene, with almost with a heavenly feel about it, you almost felt cheated from having more of their romance stolen from you. And you curse that coin that broke the spell. Finally on a word about the use of Rachmaninoff (Rhapsody of a Theme of Paganini), this hauntingly stirring and romantic tune makes a constant appearance in John Barry’s soundtrack here, in scenes with our lovers during this movie. The tune itself as a romantic recurrent theme throughout the movie. It’s symbolic for both, with both listening to it and her having a musical box with its tune. It is mentioned in their date after he hums it, with her immediately liking it. And as a love theme, is also one of my classical favourites from the movies for its overwhelming association with romance, and presence in this movie. However on buying the full classical piece, although taken back to this film on hearing the whole of this work, was shocked as another part of this rhapsody stuck a chord. This was the theme of The Old Bank Show (1978-), a long running British Arts and Media TV programme. Which was presented by Melvyn Bragg. Who to me, doesn’t conjure up wistful romance, even when impersonated by the love of my life, my Darlin’ Husband. This review of Somewhere in Time (1980) was added to in Silver Screenings and Wide Screen’s Time Travel Blogathon. Other films with this cast reviewed here include my spoiler free review of Somewhere in Time here. Christopher Plummer stars in my reviews of 5 Golden Hollywood Greats, Star Trek VI – The Undiscovered Country, The Lake House and International Velvet. And of course The Sound of Music HERE and HERE in two different reviews about this film. Christopher Reeve stars in my review of Superman here. Thanks – great tribute to this lovely film! I’ve only seen this movie once, but I love it! Achingly romantic, and definitely worth watching again. Great job as always, Gill! Thanks Chris, always great to get your comments especially this one. And such a lovely story too, I was really happy to get a follow and a like from the producer of this film and in my previous post on it Jane Seymour liked it, so we’ve covered just about all the cast and crew between us! Thank you for reminding me of all the reasons I loved this film as a kid, and still do today. What a haunting love story. I own it on VHS still:) One of my favorite aspects (besides the obvious chemistry and story between them) is how simple the devices are to show the gaps in time–how a penny and Arthur play such big roles. Its is such a much loved movie, as you say its those simple devices such as a coin and hypnosis that make it so much more memorable. Gill, the trailer alone you posted breaks a person’s heart. I haven’t seen this film, but I read your luscious review with great interest. I’ve not come across this film, but I will track it down at the library. I completely agree: Christopher Reeve and Jane Seymour are, hands down, the most photogenic pair from the 1970s. And, as you pointed, that soft focus makes them even more so. Nice going, Gill! Praise from one of the producers? Awesome!! It was such a lovely gesture – feel truly touched when you get a wee mention be it message, tweet or like. Its just like getting an autograph yet more personal. I can’t believe I haven’t seen this movie. I think whenever we crossed paths I wasn’t in the mood for a romantic story. I think I am now! Make sure you have the tissues handy, it certainly is a tearjerker! I hope you don’t mind, but I read the spoiler-free version, because this is one I’ve always been curious about because of Reeve. One of these days I’ll sit down with it. This is such a moving and beautiful film. Excellent performances by Reeve and Seymour. This is a romance classic. 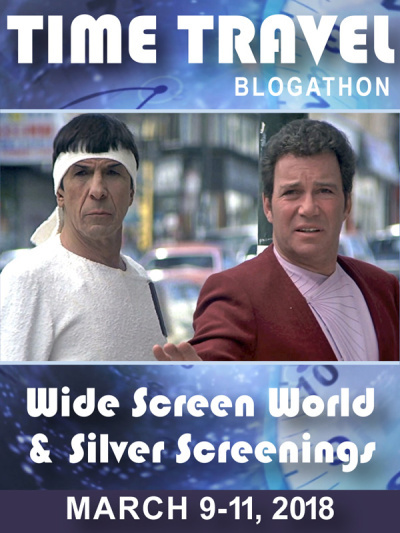 Great choice for this blogathon, Gill. It’s sure is, much more romantic than Outlander and better performances too! Cn’t beat it!